“Now concerning the coming of our Lord Jesus Christ and our being gathered together to him, we ask you, brothers, not to be quickly shaken in mind or alarmed, either by a spirit or a spoken word, or a letter seeming to be from us, to the effect that the day of the Lord has come. Let no one deceive you in any way. For that day will not come, unless the rebellion comes first, and the man of lawlessness is revealed, … The coming of the lawless one is by the activity of Satan with all power and false signs and wonders, and with all wicked deception for those who are perishing, because they refused to love the truth and so be saved. Therefore God sends them a strong delusion, so that they may believe what is false, in order that all may be condemned who did not believe the truth but had pleasure in unrighteousness” (2 Thessalonians 2:1-12). We see the seeds of the coming last days rebellion that the Apostle Paul prophesied coming to pass right before our eyes. Already the far-left political agenda has given itself over to hate, verbal vitriol, legal pressure, and economic blackmail. Now, anyone that stands in their way becomes publicly assailed and vilified. In their loss of the 2016 election, the liberal leaders and their mass followers are resorting to over-the-top rage, intimidation, vandalism, and economic extortion. America has become irreversibly divided! Families and friends suffer vicious arguments causing bitter splits. These rivalries and unfriendly discourses are even affecting business relationships. Rebel political groups are formed to bring pressure on individuals, businesses, and politicians who do not hold to their socialistic, Sodom-like immorality, and anarchist ideology. Like Korah’s rebellion against Moses in the wilderness, so too, this last days rebellion is in full stride to bring political chaos and pressure that will help usher in the antichrist rule. God’s people are not excused from this increasing chaos, persecution, and hate filled rage. Let no one deceive you in any way. For that day [Christ appearance] will not come, unless the rebellion comes first, and the man of lawlessness is revealed. A multitude of believers are indeed deceived, thinking Christ will appear and the rapture occurs before any real trouble comes, or before the antichrist becomes leader of the world. Most Christians are asleep, playing church and will become shocked as the birth-pang judgments continue to increase, leading into persecution madness. And this coming crazed persecution is accelerating because of the election of President Trump. Christians have bought into the false hope that President Trump will restore morality to the American culture and “Make America Great Again.” Even though we see great success with Trump’s leadership making head way in many areas, this will not last! In this soon to come backlash of hateful persecution, I see the Lord pouring out His Spirit for what I refer to as the midnight cry awakening, to awaken His sleeping Church for the final harvest of lost souls. This coming persecution against all Christians will be allowed by the Lord to vet his Church, separating the false from the sincere. Lust for prosperity and the idolatry of the American dream has put a spell on God’s people. 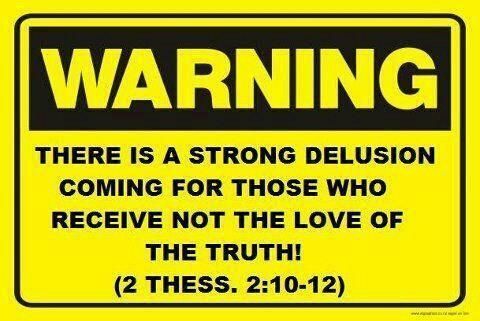 Millions of lukewarm Christians are becoming engulfed by a strong delusion, right along with the wicked. Why? Because, most Christians in America love prosperity, are content to just play church, and lustfully drive to achieve the American dream. Their love for Christ is faint in comparison for their love for this age. Many on fire believers will end up like Demos, who was in love with this present age and deserted the Apostle Paul. Few Christians embrace all of Christ’s teachings, but rather cherry pick favorite passages. Most believers are taught to stop up their ears and avoid the harder teachings of Christ and His everyday discipline that transforms inner character. Millions upon millions on fire Christians will deny even knowing Christ and fall away, and many will become traitors like Judas, betraying Christians who take a stand for the true Christ. “Then they will deliver you up to tribulation and put you to death, and you will be hated by all nations for my name’s sake. And then many will fall away and betray one another and hate one another. And many false prophets will arise and lead many astray. And because lawlessness will be increased, the love of many will grow cold. But the one who endures to the end will be saved” (Matthew 24:9-13). Millions of unprepared lukewarm Christians will soon be spewed out of Christ’s mouth because they loved this world and its pleasures more than Christ. They refuse to believe the truth and be truly saved. Rather, they continue to seek the pleasures of this life and pretend they have eternal life, while all along ignoring Christ’s commands. Satan’s angel of light workers have succeeded in deceiving millions by preaching and promoting a false gospel and a pseudo Christ, empowered by a counterfeit spirit. Thus, fulfilling another prophesy by the Apostle Paul: “For the time is coming when people will not endure sound teaching, but having itching ears they will accumulate for themselves teachers to suit their own passions, and will turn away from listening to the truth and wander off into myths” (2 Timothy 4:3-4). Just as America is splitting at the seams, so too, Christianity will split right down the middle. Again, referring to the parable of the ten maidens. As the midnight cry begins to be heard by God’s people, a fracturing, not unification will take place. Just like the ten maidens, the five foolish departed company and left the five wise maidens and went into the world. The wise maidens held their relationship with Christ, endured in the darkness waiting patiently and seeing clearly in the darkness right up to the end. The wise Christian in this coming hour will make sure they are prepared and walk in genuine faith. These believers will hold true because they will have embraced all of Christ teachings, and allowed His discipline to transform them. They will be invited into the marriage feast. The foolish maidens (Christians) will came later and ask to enter as well, only to hear from Christ: “Truly, I say to you, I do not know you.” (Matthew 25:12). Pseudo Christians will be locked out of eternity. The ecumenical push by the Emerging church has transformed itself and filtered into many Protestant denominations and most Evangelical church movements. Churches and fellowships no longer present the power of Christ to transform the repentant sinner, but rather push social good works using Christ’s name. The reformation movement that began centuries ago has become almost completely derailed as the Emerging Church movement morphs into a social helps mission in conjunction with the Roman Catholic Church. Right before our eyes, we are witnessing the formation of the last days harlot church spoken of in Revelation by the Apostle John. Unfortunately, few recognize this end-of-the-age reunification of Christianity as one of the last steps in for the transformation of visible Christianity into the last days harlot church. This last days harlot church will be a conglomeration of lukewarm and apostate Protestant Christians and the Roman Catholic denomination and other orthodox Christian sects. The main objective for this coming unification, so eagerly sought and organized by false leaders, is to ensure the Christian religion survives the coming global upheaval and is accepted by the world in the coming global unification of all nations. In the end, just prior to Christ’s return, the harlot church will be destroyed: “And the ten horns that you saw, they and the beast will hate the prostitute. They will make her desolate and naked, and devour her flesh and burn her up with fire, for God has put it into their hearts to carry out his purpose by being of one mind and handing over their royal power to the beast, until the words of God are fulfilled” (Revelation 17:16-17). Amazingly, Christians everywhere in America push Jesus as savior like car lot sales people glamorizing buying a new car. Few are told the uncomfortable truth about becoming a follower of Christ and what is required of them to succeed in growing up into salvation and being made into a disciple of Christ. Jesus is calling those who follow him today to become bond-servant-disciples, who are disciplined by the Lord personally, learning to embrace all that Christ taught in Scripture. Millions of Charismatic and Pentecostal Christians want the power of God operating within their lives but refuse to become transformed internally and have true Christlike character developed witin. They want the power of Christ, but not his transforming discipline that brings the fullness of His holy presence and his Lordship in all of life. Jesus is saying to the American Christian of today: “Why do you call me ‘Lord, Lord,’ and not do what I tell you? Everyone who comes to me and hears my words and does them, I will show you what he is like: he is like a man building a house, who dug deep and laid the foundation on the rock. And when a flood arose, the stream broke against that house and could not shake it, because it had been well built. But the one who hears and does not do them is like a man who built a house on the ground without a foundation. When the stream broke against it, immediately it fell, and the ruin of that house was great” (Luke 6:46-49). When the end-of-this-age storms reach their destructive heights, those lukewarm Christians who played church, who sat comfortably listening to Christ’s words and did not do them, will fall away. Most will become antichrist followers, or at best unduly suffer for their disobedience and lawlessness. These rebellious Christians rejected the call to buy gold from Christ refined in the fires of His discipline. Instead, they continue to lust after the lying pleasures of this world. They invest in prosperity, peace, and security at the cost of true faith. They reject Christ’s commands to store one’s treasures in heaven. In the end their worldly riches and the pursuit of the American dream will cost them their eternal salvation, unless they repent in time, showing fruit of repentance. God has allowed Satan to set a trap for the lawless Christian in many ways. One way is the current slogan “Make America Great Again,” bolstered by the current historical surge in the economy. Millions of world-loving Christians believe God is going to restore America. Millions of on fire believers will find themselves locked out of the marriage feast at Christ’s coming, because they loved this life more than Christ and refused to embrace and do all that Christ commands. “On that day many will say to me, ‘Lord, Lord, did we not prophesy in your name, and cast out demons in your name, and do many mighty works in your name?’ And then will I declare to them, ‘I never knew you; depart from me, you workers of lawlessness’” (Matthew 7:22-23). Beware of “Making America Great Again” and being sucked into this last day’s prosperity and temporary pushback against wickedness. It is a trap for the undiscerning Christian. “But watch yourselves lest your hearts be weighed down with dissipation and drunkenness and cares of this life, and that day come upon you suddenly like a trap. For it will come upon all who dwell on the face of the whole earth. But stay awake at all times, praying that you may have strength to escape all these things that are going to take place, and to stand before the Son of Man” (Luke 21:34-36).